For the West Indian cricketer, see Jean Paul (cricketer). For other people of the same name, see Jean-Paul. Jean Paul (German: [ʒɑ̃ paʊl]; 21 March 1763 – 14 November 1825), born Johann Paul Friedrich Richter, was a German Romantic writer, best known for his humorous novels and stories. Jean Paul was born at Wunsiedel, in the Fichtelgebirge mountains (Franconia). His father was an organist at Wunsiedel. In 1765 his father became a pastor at Joditz near Hof and, in 1767 at Schwarzenbach, but he died on 25 April 1779, leaving the family in great poverty. After attending the Gymnasium at Hof, in 1781 Jean Paul went to the University of Leipzig. His original intention was to enter his father's profession, but theology did not interest him, and he soon devoted himself wholly to the study of literature. Unable to maintain himself at Leipzig he returned in 1784 to Hof, where he lived with his mother. From 1787 to 1789 he served as a tutor at Töpen, a village near Hof; and from 1790 to 1794 he taught the children of several families in a school he had founded in nearby Schwarzenbach. After his mother's death in 1797, Richter went to Leipzig, and in the following year, to Weimar, where he started work on his most ambitious novel, Titan, published between 1800–1803. Richter became friends with such Weimar notables as Johann Gottfried Herder, by whom he was warmly appreciated, but despite their close proximity, Richter never became close to Johann Wolfgang von Goethe or Friedrich Schiller, both of whom found his literary methods repugnant; but in Weimar, as elsewhere, his remarkable conversational powers and his genial manners made him a favorite in general society. The English writers Thomas Carlyle and Thomas De Quincey took an interest in Jean Paul's work. 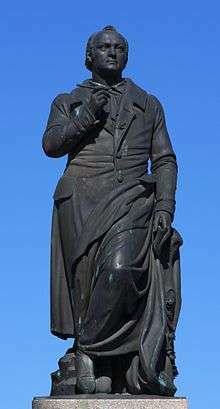 The Jean Paul monument in Bayreuth, created by Ludwig von Schwanthaler and unveiled in 1841 on the 16th anniversary of Richter's death. Jean Paul's Titan was followed by Flegeljahre ("The Awkward Age", 1804-5). His later imaginative works were Dr Katzenbergers Badereise ("Dr Katzenberger's Trip to the Medicinal Springs", 1809), Des Feldpredigers Schmelzle Reise nach Flätz ("Army Chaplain Schmelzle's Voyage to Flätz", 1809), Leben Fibels ("Life of Fibel", 1812), and Der Komet, oder Nikolaus Marggraf ("The Comet, or, Nikolaus Markgraf", 1820–22). In Vorschule der Aesthetik ("Introduction to Aesthetics", 1804) he expounded his ideas on art; he discussed the principles of education in Levana, oder Erziehungslehre ("Levana, or, Pedagogy", 1807); and the opinions suggested by current events he set forth in Friedenspredigt ("Peace Sermon", 1808), Dämmerungen für Deutschland ("Twilights for Germany", 1809), Mars und Phöbus Thronwechsel im Jahre 1814 ("Mars and Phoebus Exchange Thrones in the Year 1814", 1814), and Politische Fastenpredigten ("Political Lenten Sermons", 1817). In his last years he began Wahrheit aus Jean Pauls Leben ("The Truth from Jean Paul's Life"), to which additions from his papers and other sources were made after his death by C. Otto and E. Förster. He thought that both the Enlightenment and metaphysics had failed, though they still held importance for his worldview. He arrived at a philosophy without illusions, and a state of humorous resignation. Correspondingly he was one of the first defenders of Schopenhauer's philosophy. He didn't try to indoctrinate but to portray human happiness, even (and especially) in an increasingly alienated environment — the rococo castles and bleak villages of Upper Franconia. Jean Paul was not only the first to use and name the literary motive of the Doppelgänger, he also utilised it in countless variations (e.g. Siebenkäs and Leibgeber, Liane and Idoine, Roquairol and Albano). In his novel Siebenkäs he defines the Doppelgänger as the "people who see themselves." 1 2 3 4 5 6 7 8 9 10 11 12 Chisholm 1911. 1 2 3 Americana staff 1920. Americana staff (1920). "Richter, Johann Paul Friedrich". In Rines, George Edwin. Encyclopedia Americana. This article incorporates text from a publication now in the public domain: Chisholm, Hugh, ed. (1911). "Richter, Johann Paul Friedrich". Encyclopædia Britannica (11th ed.). Cambridge University Press. 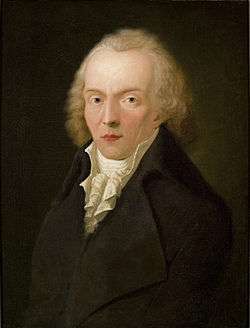 Wikimedia Commons has media related to Jean Paul. Wikisource has the text of the The Nuttall Encyclopædia article Richter, Jean Paul Friedrich.